Stunning and dramatic coastline, breathtaking scenery set against the rugged beauty of the sea, splendid sandy beaches, and wonderful walking and cycling trails. Isle of Man Beach Holiday Cottage is something special, centred on the promenade in this thriving historic seaside city and vibrant bustling fishing port of Peel. Come and experience the island’s unique coastal charm and atmosphere from here. Situated on the spectacular seafront, surrounded by natural beauty and splendid sea views, this original Manx fisherman's cottage is perfectly placed for admiring the striking Peel sunsets. Perfect panoramic views over the Irish Sea to the Scottish and Irish coastlines. Seals, gannets and even basking sharks have been seen swimming and diving right outside this attractive self catering accommodation. 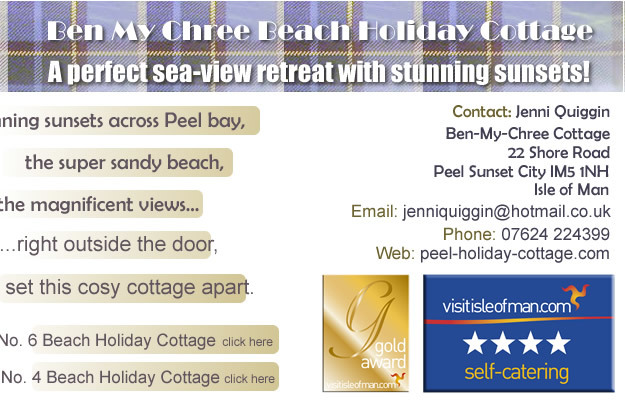 Enjoy shops, supermarkets, magnificent museums, coastal walks, boats for fishing, shark, seal & wildlife spotting, cycle hire, fishing, golfing and sailing with Peel clubs, coasteering, kayaking and an indoor swimming pool, all within a few minutes walk from this splendid self catering cottage. 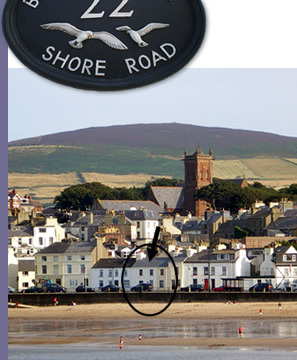 Isle of Man Beach Holiday Cottage (5* Trip Advisor reviews) is centred on the spectacular seafront, surrounded by natural beauty and splendid sea views as far as the Irish and Scottish headlands. 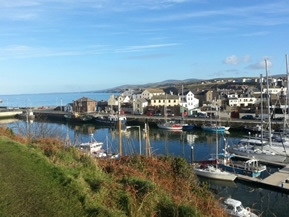 Peel Sunset City is perfect for exploring the idyllic Isle of Man. Gem of the Irish Sea! 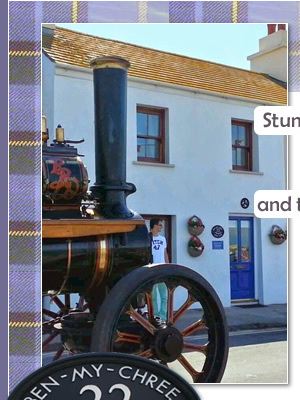 Nestled in the centre of the conservation area of the Old Cathedral City, this traditional Manx fisherman's cottage is conveniently close to popular family pubs, restaurants and bars. This beautiful beach cottage, providing wonderful character and history, has gas central heating with a combi boiler for instant hot water. Downstairs, a large cosy lounge with a 42 inch plasma colour television and DVD player, and we offer free Wi-Fi. Double glass doors open onto a rear patio area with a magnificent mural painted by a local artist to reflect the views from the front of the cottage. This high quality cottage has been lovingly renovated to provide welcoming comfort for both the business and leisure traveller, and is easily accessible from the airport and ferry services. For your comfort the cottage is non-smoking, and pet-free! 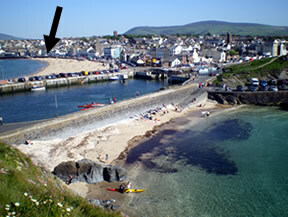 If you book Isle of Man Peel Beach Holiday Cottage we offer competitive ferry prices. "It feels like you are sleeping on the beach"
"Best s/c accommodation we’ve stayed in. Peel is gorgeous"
"We all loved the cottage as soon as we came through the door and felt warmed to find ‘extra essentials’ such as wine, chocolate and flowers"